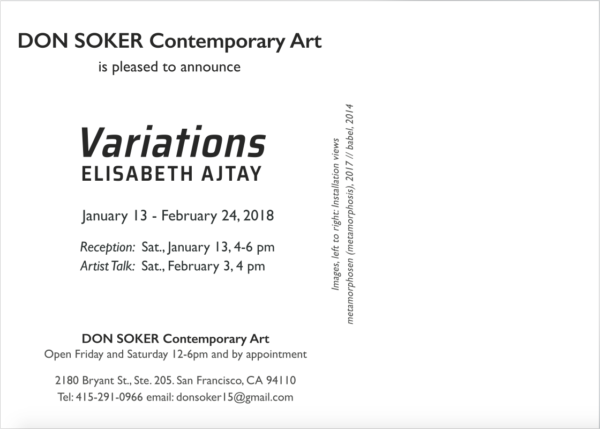 Variations is comprised of two bodies of work. 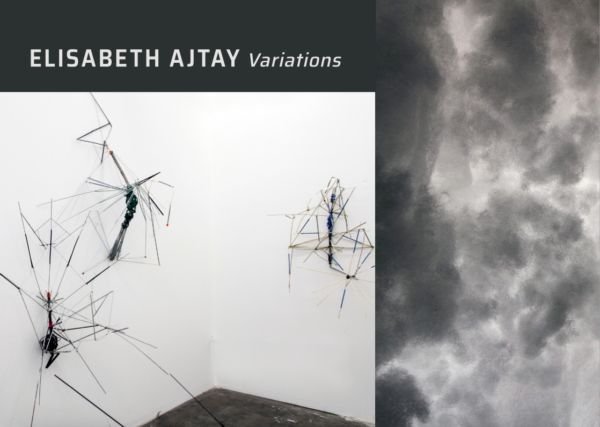 The first one presented in this show is called metamorphosen (metamorphosis), 2013-2017, in which the artist uses found umbrellas and wires as source material. The umbrellas were picked up in the urban landscape; damaged by weather conditions against which they were promised to offer shelter. The collected objects are unveiled from the torn fabric and reduced to their post-functional skeletons. The shape caused by the damage is the vantage point for the development of each sculpture/creature. As these mechanical objects lost their functionality to offer shelter, they transformed into organic forms. The sculptures are playful and beautiful, yet at the same time dangerous and eerie. The skeletons resemble insects. Also exhibited is a series of chromo graphs, photo process images of the sculptures. Ajtay has invented a typology of a non-existent species. A second element of the exhibition is the babel installation (2012/2017), which is a sound piece about Kant’s Categorical Imperative. It is comprised of recordings of the Imperative in 16 different languages. The Imperative symbolizes a core value to human being. Its philosophy seeks the truth, the essence of human interaction. Consciousness, a sense of self and understanding towards the other is required in order to live according to this maxim. The sound collage further addresses the beauty and variety of language. Each voice is an expression of its culture’s rhythm. Through listening we try to memorize the known language, while simultaneously diving into different sound worlds and rhythms. The individual languages evolve into a unifying murmur.